When times get tough, did you ever take on a job or make something for free just to build up your resume and showcase what you could do? That’s exactly what one New York up-and-comer did, and it really paid off. 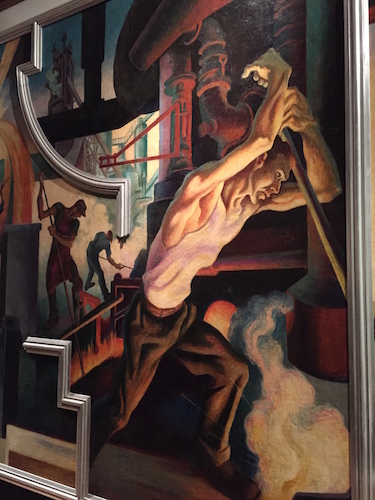 The Metropolitan Museum of Art’s show, Thomas Hart Benton’s ‘America Today’ Mural Rediscovered, tells the story. Back in 1930, the New School was just completing its modern building in the Village on West 12th Street and was seeking something to jazz up the boardroom. Mr. Orozco, the famed Mexican muralist, had already been commissioned for the more visible dining room/lounge, and Mr. Benton, who was teaching at the Art Students League, saw an opportunity to showcase his painting chops. 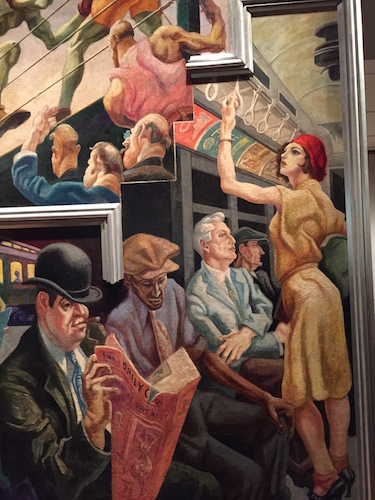 Social realist chronicler Reginald Marsh had introduced Benton to the mysteries of mastering egg tempera, and Benton felt ready to go to town on a large-scale portrait of American life in all of its regional glory. Here’s the deal: no pay, just loft studio space about a block away. Twenty years earlier, Benton had hung around Paris, soaking up the birth of the French Cubist and Italian Futurist movements in Europe. Ten years earlier, he roamed around the back roads of the United States, filling up sketchbooks with steel town landscapes, lumber camps, oil derricks popping up in Los Angeles, dives, diners, and small town stuff. The mural began taking shape, crammed to the gills with swirling activities, people, industry, and pop culture that he saw. Need models? Why not ask Jackson Pollack, his art student, and his sister to pose? It’s hard to imagine serious board meetings taking place in a room so alive with oversized ambition and action. Over the decades, the New School repurposed the room for classroom lectures, and over time, the scuffed mural was removed completely. 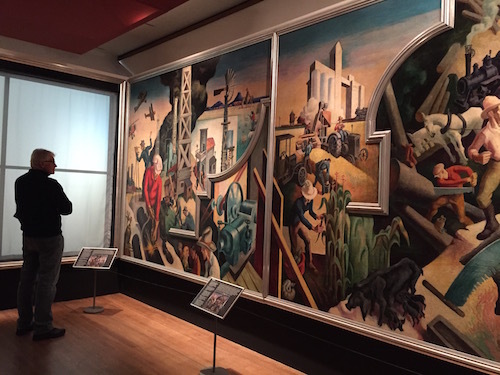 Lucky for us, Benton’s 1930s historic masterpiece found its way to the Met, which has lovingly restored and installed it in a rectangular room just beyond the Frank Lloyd Wright room. The curators have filled the adjacent galleries with extra treats: the inspirational sketches from Benton’s earlier road trips and works by Mr. Pollack and Benton’s Village contemporaries. See our Flickr album to glimpse the installation (and works by early Pollack, Abbott, Marsh from the Met’s collection), and watch the Met curators tell the story of how Mr. Benton’s freebie paid off and their joy in giving this ten-panel chronicle a new home. This entry was posted in Art, History, Museums and tagged art, culture, drawing, museums, painting, photography, video by mssusanb. Bookmark the permalink.